This Mother’s Day we’re thinking about how much fun a pizza making party for Mom would be. Surprise her with something beyond basic by including early spring asparagus with lemon zest and fresh oregano for a more sophisticated spin on what she’ll expect. She’ll be soooo impressed with your sourcing a seasonal and local green as the star of this show. 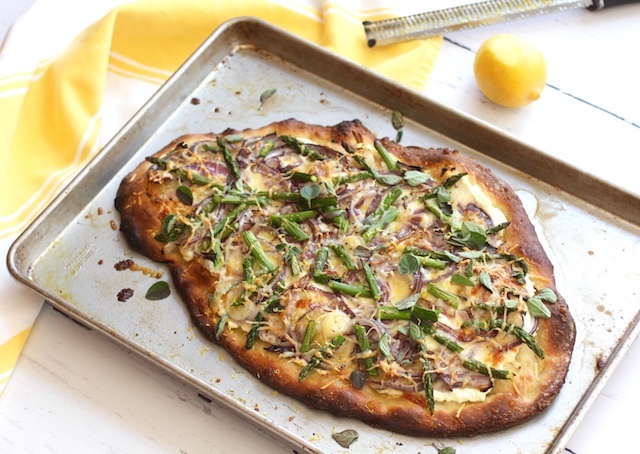 Making homemade pizza is a fun family activity for kids of all ages. It can be very free-form with loosely shaped ovals stretched on an oiled sheet pan and plenty of colorful veggies scattered over the surface. We’ve opted to use store bought dough here to keep this party more focused on the kid-friendly activity with less worry about achieving the perfect crust. If you’ve got kids that love making dough from scratch, click here for a great four ingredient recipe from The Kitchn Cookbook. Plan ahead as this dough needs at least 1.5 hours of rise time before it’s ready to be handled. For another pizza focused on early spring greens, try this salad topped pizza with arugula tossed in lemon honey vinaigrette and dotted with goat cheese. I demo’ed both of these pies on WTNH early morning weekend show on Sunday! Check it out here. Want to go dough-free altogether? We love this portobello mushroom pizza that highlights large scooped out ‘shrooms as a cup for mashed cannelini beans, fresh tomatoes and fontina. If you don’t like gluten-free doughs this is a great option for those leaning in that direction. All of this said, there is NOTHING wrong with the most basic pizza of all. Most of the time, young kids want just that! For the most basic recipe of all, simply follow our instructions for pre-baking the dough, below. Spread favorite tomato sauce over the dough and sprinkle with plenty o’ mozzarella. See if you can sneak in a little green. Or not. It’s all about the family fun time. Making homemade pizza is always an adventure for kids of all ages. Even preschoolers can get in on the action by sprinkling ingredients across the surface. Be sure to ask older kids which toppings they’d like so they are invested in this all family pizza making party in honor of Mom. We've used store bought dough here, to keep the focus on creative toppings. If your gang prefers to make their own dough (it's really easy), we love the basic dough from The Kitchn Cookbook (see post above for link). Remove pizza dough from refrigerator and bring to room temperature for 30-45 minutes. Preheat oven to 500 degrees F with oven rack in center of oven. Oil sheet pan with 2 Tb. oil using pastry brush or paper towel. Dust hands lightly with flour and gently stretch dough into an oval that covers as much of the pan as possible. It should be about ¼-½ inch thick. Brush dough with 1 Tb. oil and poke 8-10 holes into it with a fork (so it doesn’t puff up and bubble). Bake dough for 7-9 minutes or until just golden and dry. Remove crust from oven and set aside.If crust has bubbled, poke with fork again. Toss sliced onions in a small bowl with remaining 2 Tb. olive oil. Season with salt and pepper. Rinse asparagus and pat dry with dish towel. Bend stalks towards the bottom part and they will snap at the perfect place. If stalks are thick, slice vertically. Slice each stalk on the diagonal so pieces are about 1 inch long. Using the back of a spoon, spread the ricotta across the dough, leaving about ¼-½ inch of the crust revealed at the edge. Top with mozzarella and distribute onion mix over the mozzarella. 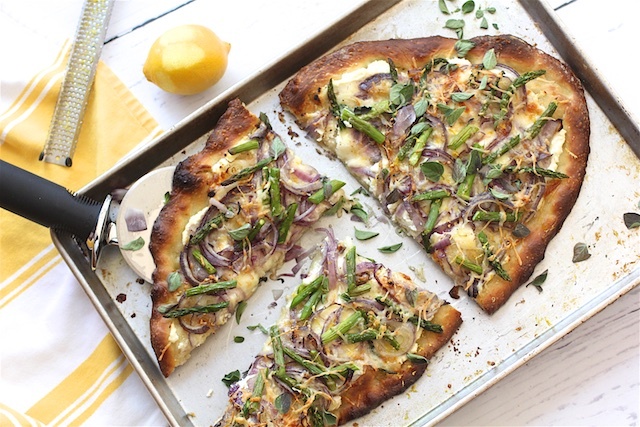 Bake pizza for 10-14 minutes until cheese is bubbly and crust is browned to your liking. Remove from oven and garnish generously with oregano and lemon zest. Allow pizza to cool for 3-4 minutes so it’s easier to handle. Slice with pizza cutter or serrated knife and serve. Pre-bake the dough (see instructions, above) to firm it up and create a stronger base for toppings. You’ll avoid a soggy crust this way, too. 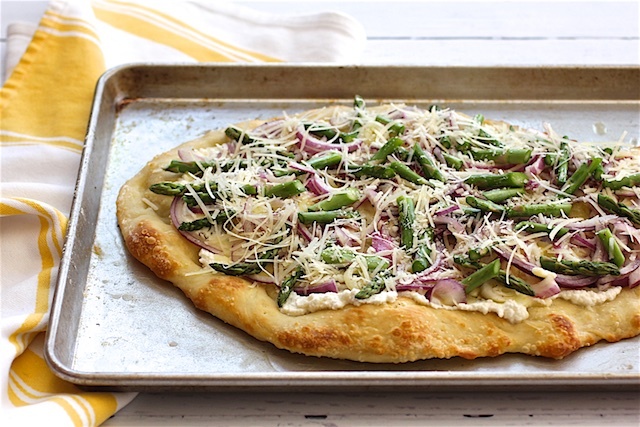 *Cut long asparagus stalks in half if you’d like a spoke pattern across the pizza. Or arrange stalks like stripes with tips and tails alternating directions. If you prefer random asparagus pattern, cut stalks into 1 inch pieces on the diagonal and distribute as you like. Thanks! Have you started growing asparagus yet? If not, check out the link to salad pizza with arugula and goat cheese (above). Early spring greens are up!